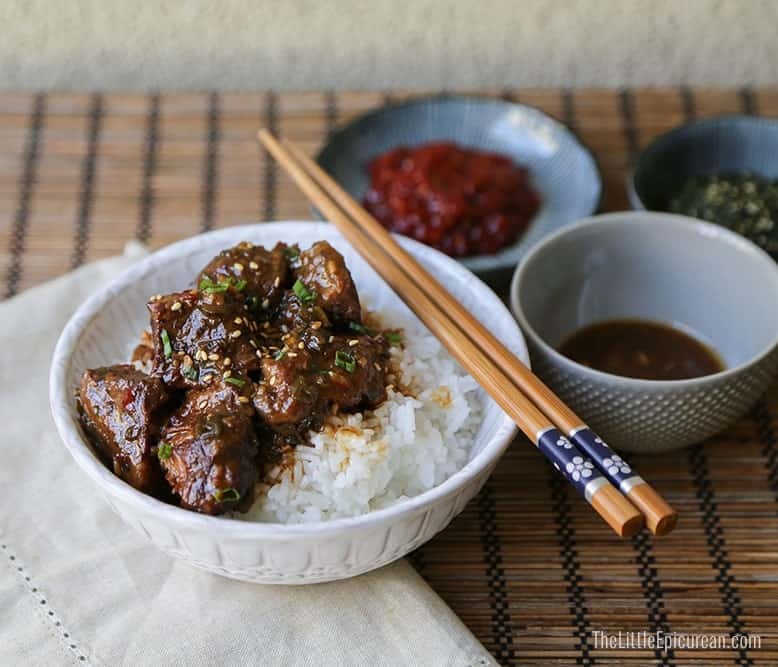 This easy to make slow cooker Asian braised beef combines garlic, ginger, lemongrass, soy sauce, and rice vinegar to create a delicious hearty dish. Serve it over rice, noodles, or steamed vegetables. I cannot live without my slow cooker. I make all sorts of food in there from crème brûlée to loaded baked potato soup. It seems like most of my slow cooker recipes are reserved for American and French foods. I guess when I think slow cooker, I envision a lot braised beefs, creamy soups, and hearty stews. You don’t normally see a lot of Asian foods prepared in slow cookers. Naturally, I had to experiment. I tried out a dish I would normally cook in the oven or on the stove. 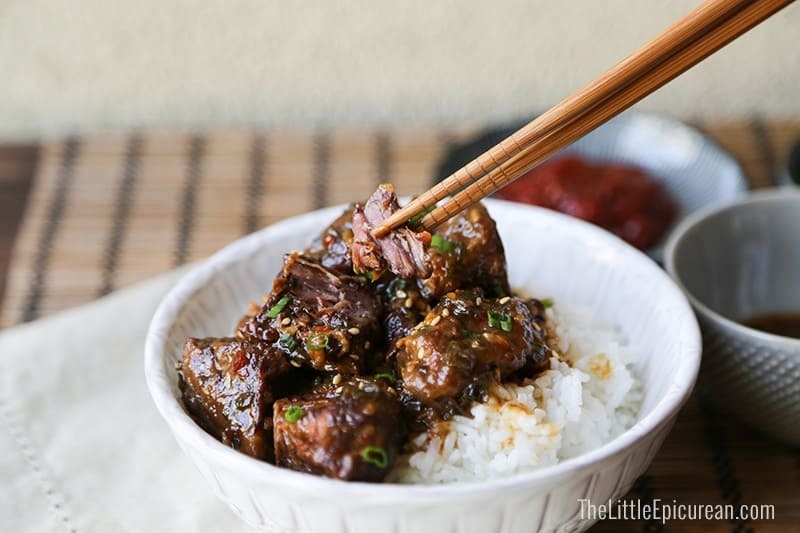 This is my slow cooker Asian braised beef. I had to make this as soon as I saw it! I made a few mods to make it gluten-free (coconut flour, coconut oil, and liquid aminos in lieu of soy sauce), but I am super excited to try it tomorrow! Hi Abby! I hope you enjoyed it :) I haven’t tried cooking with coconut flour. Does it add a coconut-y flavor? Can I make it just in a pot if I don’t have slow cooker? Hi Paulina! Yes, you can totally make it in a regular pot. I would love to make this but all I have in my house is lemon juice, no access to lemongrass at the moment. Is it still doable? Hi Rie, unfortunately lemon juice and lemongrass are completely differently in taste. If you don’t have lemongrass, just omit it in the recipe. I would not suggest substituting lemon juice. Sounds good, thank you for the quick response! My husband loved it. I had all ingredients with the exception of lemon grass and rice vinegar and believe it or not it still turned out decent. I used 1 pound of flank beef and cooked on high for about 5 hours. Thanks for the recipe. That’s awesome, Noelle! Great to hear it turned out okay! I am English, so can you tell me what are green onions? Are they what we call Spring onions & the West Indians call scallions? Yes, green onions are also called scallions. They look like giant chives. My husband and I just finished eating this!! We were blown away with the flavors!! It is so delicious! I know I may sound like a pig, but I already can’t wait to have the leftovers tomorrow ;) Thank you so much for posting this amazing recipe!! I made this tonight for my boyfriend and me. It turned out delicious! The only downside was that my boyfriend polished off every last bite so I won’t have any leftovers :) Great recipe! ive been debating about the slow cooker thing for month. I think I’m finally going to do it so I can make this. Do it! You can make it before you leave for work and come home to a delicious meal! This is just delicious. I halved the recipe thinking 3# of meat was too much for 2 people but I’m sorry I did. There were no leftovers! My grocery store did not have lemongrass so I omitted it. Not sure it was missed but wondering what it would have added to the already delicious flavor. Looking forward to making this again. We both said that adding pineapple next time would make this even more awesome. Ok, my mouth just watered! Hi Ami! I’m so glad you liked! It’s one of my family’s favorites and I always have to make a double batch. No need to add lemongrass if you’d have it. I like it because lemongrass adds a little herbal citrus flavor. A word about pineapples– Fresh pineapples contain the enzyme bromelain which breaks down meat fibers, thus tenderizing the meat. (Papaya and kiwi have similar properties.) Since this recipe cooks the meat for quite a long time, I do not suggest adding pineapples to the cooking process. You will end up with a pot of mush. If you would like to add pineapples, be sure to add it at the very end. However, cooked or canned pineapples are a different story. They are likely not to affect the meat. I hope that helps! Great recipe! Flavor turned out nice but the beef wasn’t melt in your mouth. :( I left it on high for 5 hours. Did I leave it too long or not long enough? Thanks! Keep the yummy recipes coming! I am going to make this in the slow cooker this weekend – it looks delicious! May I ask if I did not have Sriracha Sauce…and is there any other sauce I could use? Thanks. You can simply omit it. I add it to provide a little kick of spice. I just made this with lean stew beef instead for a lower fat option. GREAT recipe that will be in the rotation now. Cooked up in 3.5 hours on high. He lived in Korea for two years so he loves anything asian flavoured (and he loves meat!) and this recipe popped up in my Pinterest search so I’m off to make it right now! Hopefully I don’t stuff it up… I’ll let you know! I have it in the slow cooker RIGHT NOW and it smells amazing! 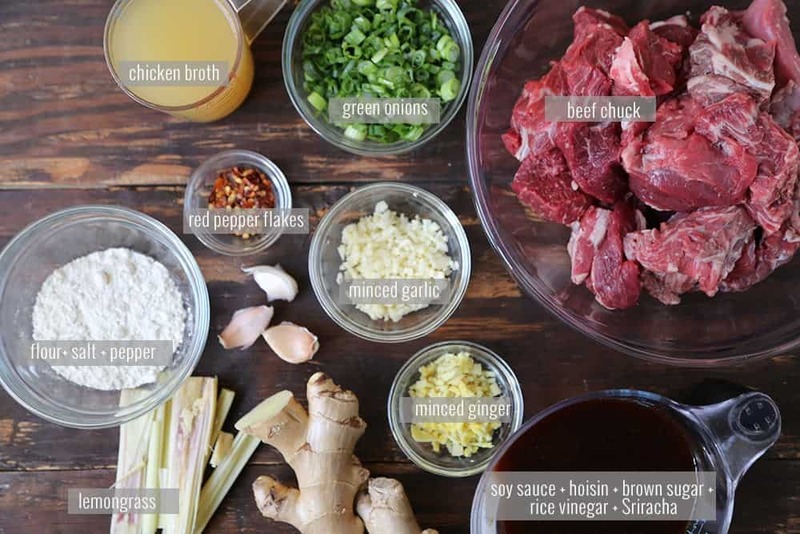 I don’t have enough beef slow cooker recipes up my sleeve, so I’m looking forward to trying this one…I have a feeling it’s going to be a keeper :) Thanks! I’m so glad I read through the comments, as I’ve got some fresh pineapple I thought of throwing in and now I’ll make sure to wait until the end! I’m also using brisket as that’s what I have on hand…I’ve never cut it/cubed it before but hopefully it will work out OK! Can I use sirloin cut in large cubes? It’s just what I have on hand, and what if I don’t have any hoisen sauce? I used chuck because it contains a lot of connective tissues which is good for long, slow cooking. Sirloin will get very dry and fall apart. I would use chuck, brisket, or short rib. Hoisin sauce gives this dish the sweetness and flavor. I don’t know any substitutes. Awesome recipe, the whole family loved it. I used 3lbs of Brisket and it worked. Have you tried other meat, such as Leg of Lamb? Thanks for trying out the recipe! Glad your family enjoyed it! No, I have yet to try this recipe with other meats. 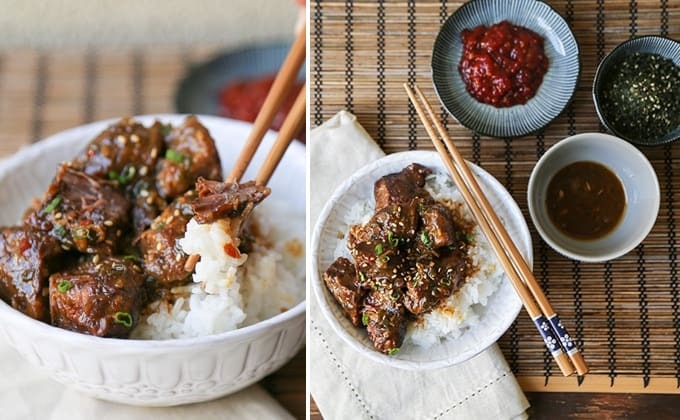 Hi, I found this page, http://makimy.com/slow-cooker-asian-braised-beef/, and it contains the very same words and images from this page. I also checked other recipes from the site and found that they could also be traced from other websites. I don’t know if you guys are affiliated or not, so please correct me if I’m wrong. Hi! How important is it to brown the beef and the garlic etc. beforehand? I’m looking to try more of a “dump” recipe and ideally would love to just put everything in the slow cooker without much effort. Any thoughts on what difference this might make? Thanks! For this recipe, it is important to brown the beef and cook the garlic and ginger before placing it in the slow cooker. It adds flavors. It will definitely change the taste and texture of the dish if you simply “dump” everything into the slow cooker pot. A gem of a recipe! Turned out amazing and will definitely make this again!! Made this for a dinner party. An easy recipe that’s great to make in advance. Next time, I would drastically reduce or omit the vinegar all together. I LOVED the flavors until I added the vinegar and found the acidity overpowered the whole thing :( A drizzle of sesame oil and scattering of cilantro helped pull it together. Thanks for trying out the recipe! I’m sorry the rice vinegar didn’t work out for you. Are you sure you used rice vinegar, not regular white vinegar? Rice vinegar is generally sweeter in flavor. Other than that, I hope you give it another try! Why Chicken broth with beef? I prefer to use chicken broth because I find it more flavorful. Feel free to use water or beef broth in its place. Is there a way to marinate this the night before? And can I brown it before marinating? The meat isn’t marinated. It is seared and then placed in the slow cooker with the remaining ingredients. The beef cooks in the sauce. If I’m making this for the kids will it turn out ok if I miss out the chilli flakes? I don’t have any, or chilli sauce? Will it be too sweet znd unbalanced without both or should I still add at least one or the other? Yes, you can omit the chili flakes. However, I would not omit the Sriracha hot sauce. That’s wonderful to hear! I suggest adding vegetables like broccoli during the last 10-15 minutes of cooking. More delicate vegetables like spinach, peas, and kale can be stirred in at the end of cooking. I hope that helps! Any idea of this freezes well? I have not trying freezing this recipe. Whenever I make it, this dish gets eaten very quickly! I would like to make this in a dutch oven. What would the timing and heat level be? I made this recipe last Saturday and my family and guests loved it. We made the following modifications.. we used 4 lbs chuck roast and increased all the ingredients by 1/3 except we only used 1 tbsp brown sugar. When we make the recipe again we will eliminate the sugar as there is enough sweetness from the rice vinegar and hoisin sauce. We will also eliminate the salt as again there is so much salt in the hoisin and soy sauce (even with reduced salt). The dish was amazing and we served it with steamed broccoli and steamed carrots. Our 4lbs of chuck served 7 hungry people and we could have used more for additional helpings. Thanks so much for posting the recipe as it is delicious and easy! !